Crown Collector mice were renowned for their rarity and difficulty to catch. Even such powerful mice as the Dojo Sensei came to them for advice on how to properly pillage pesky Hunters! Over time, these mice began to charge a fee for his advice... and their only fee was the crowns that the King awarded to his most elite Hunters. Now obsessed with gaining more and more crowns, these mice most often visit the traps of hunters who have earned several crowns themselves. The Crown Collector Mouse has a strong attraction for SUPER|brie+ but can also be attracted using Standard Cheese. In the Bazaar location, the Crown Collector Mouse can also be attracted when hunting with Gilded Cheese. Aboard the S.S. Huntington IV , the Crown Collector Mouse can also be attracted when hunting with Galleon Gouda. No Charms are required to attract the Crown Collector Mouse. 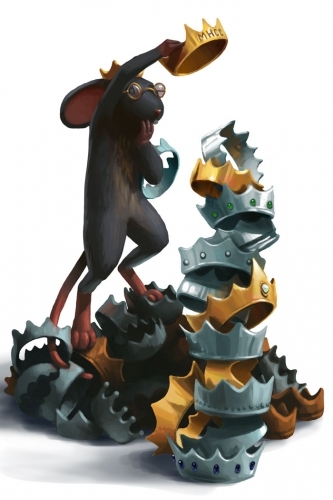 The Attraction Rate of the Crown Collector Mouse is affected by the number of silver and gold Crowns a Hunter has obtained. As the number of collected crowns increases, the encounter rate for this mouse will improve, though the effect will be small. The Crown Collector Mouse is not known to drop any loot. Attraction info and special event loot drops for the Crown Collector Mouse can be found at the individual event location pages. The Crown Collector Mouse drops the Crown Collector Egg during the annual Spring Egg Hunt. 5 August 2011: The Crown Collector Mouse was painted live during an 'All about the art' Feedback Friday. Ideas and suggestions for how the mouse should look were provided by the audience at the time of painting. 12 August 2011: The Crown Collector Mouse was introduced in recognition of the MouseHunt Century Club. 4 April 2012: The Crown Collector Mouse began dropping a bonus Crown Collector Egg as loot during the Spring Egg Hunt 2012 event. 25 June 2013: The Crown Collector Mouse gained a vulnerability to Law power type traps with the release of Varmint Valley. 25 March 2014: The Crown Collector Mouse gained a vulnerability to Rift power type traps with the introduction of the Rift Plane. This page was last edited on 2 January 2019, at 14:01.